Agrizest Trial Summary 2: Kiwifruit. Agrizest Trial Summary 3: Apples. For conventional and organic production. Biozest has been developed and proven on New Zealand farms. Biozest increases pasture productivity and ruminant efficiency to increase milk and meat production and reduce the environmental impact of farming. Biozest is a pasture spray for organic & conventional farms. Biozest helps pasture naturally resist stress and damage and improves pasture growth, quality and resilience. Biozest treated pasture is more easily converted to valuable meat and milk instead of waste products like urea and greenhouse gases. Biozest is manufactured from plant extracts, fatty acids, plant compatible organic acids and wetting agents. Thank you. Get your Biozest programme and guidance here. In this baleage trial, all Biozest treated paddocks, in both set A and Set B, outperformed the untreated paddocks. Overall, the Biozest treated paddocks yielded over 2.2x as many bales as the untreated paddocks. This trial was carried out on a dairy farm on the Hauraki Plains. In autumn, gestating cows grazed Biozest treated pasture and untreated pasture in cycles of approximately 8 to 10 days. Dairy cows grazing on Biozest treated pasture produced 8.5% more milk solids and 12.2% more fat per litre compared to when they were feeding on control (untreated) pasture. The average decrease in urea excretion is 37% (2-tailed t-test p=0.03). Biozest is applied to pasture as a liquid spray. 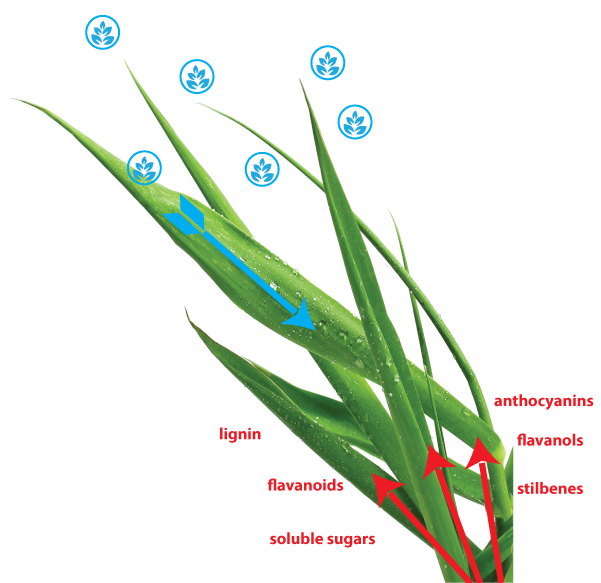 All plants have receptors on their surfaces that detect changes (such as high UV light, pest attack or disease) and trigger an immune/defence response from within the plant. Biozest is designed to be detected by these same receptors so that plants respond to Biozest via the same immune/defence system. This triggers the ‘phenylpropanoid pathway’ - production of a wide range of bioactive molecules which sustain plant immune systems, assisting plants to overcome stress and damage from pests, disease and environmental effects such as frost or drought. By producing these bioactive molecules Biozest treated pasture is more resilient and more productive. Ruminants are inefficient. Only 20-25% of pasture protein is converted to milk or meat. The rest is lost as waste via urine and dung while energy is lost as methane gas. The bioactive molecules (phenylpropanoids) in Biozest treated pasture protect the protein so more pasture is converted to milk or meat instead of being broken down to ammonia and excreted as urea. Biozest treated pasture also has higher levels of soluble sugars which provide energy at key stages of digestion and allows even more pasture to be converted to milk or meat. Pollution is the result of wasted resources. Urea is a loss of valuable protein and methane is lost energy. By utilising more pasture protein for milk or meat and reducing urea production, the building blocks for methanogenisis are diverted away to other metabolic pathways. Biozest enables ruminants to better utilise the pasture they are fed - so waste in the form of both urea and methane will be reduced.